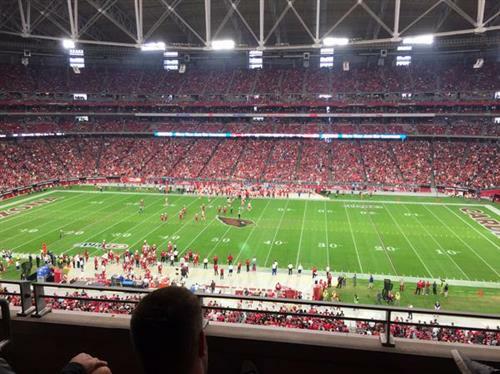 The Kansas City Chiefs take on the Arizona Cardinals at University of Phoenix Stadium. Big 43yd return by @TedGinnJr_19 on the opening kickoff. The #AZCardinals start on their own 38. Jaye Howard easily through the line dropping the RB for a loss. Good start for KC D.
Good lord, Mays lit up the FB. Welcome back. Dee Ford came off the edge for the #Chiefs defense on that third down play. The #AZCardinals convert on 3rd down. Stanton to @MichaelMFloyd for 13 yards to the KC 42. That's a FANTASTIC play by #Chiefs safety Ron Parker. Perfect angle coming downhill to make that tackle for a loss. Forces FG attempt. That could have been worse. Eight plays, 36 yards, and the #Cardinals hit the FG to take the early 3-0 lead.
.@TheCatMan39 booms a 44yd FG. 8 plays, 36 yards in 4:05. #AZCardinals 3, #Chiefs 0 with 10:55 left in Q1. #AZCardinals take a 3-0 lead. #Chiefs lead the NFL in average starting position after kickoff at the 26.2 yard-line, #Cardinals rank last at 18.9. Charles is jogging on the sideline for the trainers. The #AZCardinals force a #Chiefs punt. Touchback. AZ 1st and 10 from own 20. KC 7, AZ 3 with :50 left in Q1. It is so, so, so clear that teams are expecting the screen on 3rd and long at this point. Needs to be shelved for awhile. After jogging a bit along the sideline, Charles is getting looked at by the trainers on the #Chiefs sideline. End of the 1st quarter. AZ 1st down at their own 30. On 3rd down, @drewstanton hits TE @House81 for 20 yards to the #Chiefs 42. OK. Charles with an ankle injury and is questionable. 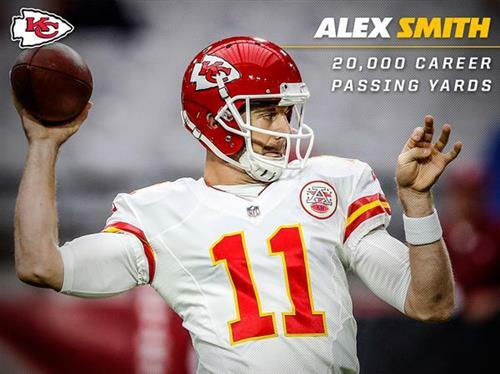 #Chiefs Alex Smith has eclipsed 20,000 passing yards in his career. Another 1st down connection between @drewstanton and @LarryFitzgerald takes the #AZCardinals to the #Chiefs 29. #AZCardinals doing a much better job running the ball. @kerWINning_ gets a 1st down to the #Chiefs 19. Stanton took a shot on that last completion to Fitzgerald. Chiefs D stiffens up (yes, that's what she said) in red zone to force FG. KC leads 7-6 in second quarter.